Many reviewers of this film were disappointed because the film covers familiar stories about the Holocaust. Similarly I felt that film at times became melodramatic and lame. Particularly Ryan Reynolds in the lead role is irritating. Nonetheless, I found it rewarding to see one more the crimes that were by the Nazis against Jewish and other people who were deemed inferior to the “German Race”. Very powerful are the street scenes in which Jewish people are being forced to clean the streets while the non-Jewish bystanders looked on with contempt or indifference or both. The terror that Jewish families would feel was skillfully enacted. Back to the painting. Adele’s two nieces manage to escape Nazi Austria and eventually settle in Los Angeles. One of them, Maria, is able to escape literally just before it is too late by taking a plane to Cologne and the crossing the border to Netherlands before getting to the USA. The parents and many other of their families and friends perish in concentration camps. The film opens more then 50 years later. Maria’s sister had just died and left her letters written during the war. Maria has also heard that the Austrian government started a program to give back pieces of art that were stolen from Jewish families during the war. Maria wonders if she can get back the painting of Adele that she saw so often in the living room of her Aunt. 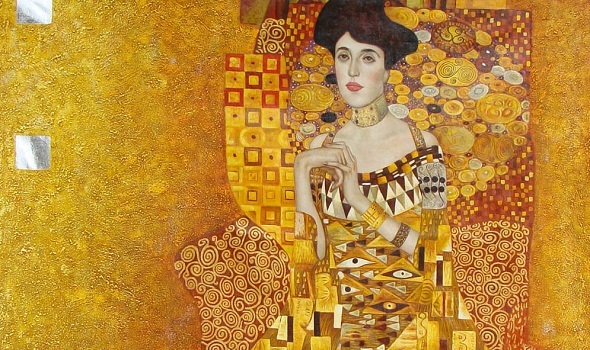 Since I like Klimt’s paintings very much, I enjoyed watching Maria’s quest to get back Woman in Gold, despite the aforementioned shallow moments. This entry has been viewed 291 times.